Travel to Seoul and you can easily navigate your way around the majority of the city by subway. Visit Los Angeles and it’s pretty tough to do much of anything if you don’t have your own private car. Bangkok on the other hand is a city where nearly every possible mode of transportation is available and necessary to use on a regular basis to get around. On any given day navigating Bangkok you’ll likely have to take the BTS Skytrain, hop in a tuk tuk for a quick ride, take a taxi, or jump on the back of a motorbike to beat the traffic or get deep into the neighborhood. 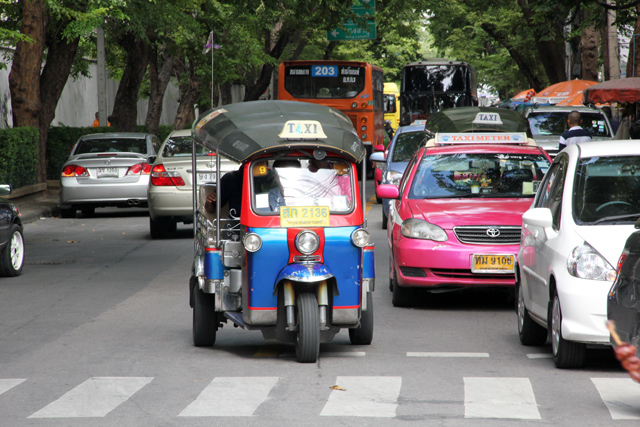 So here are the five most common forms of transportation in Bangkok. 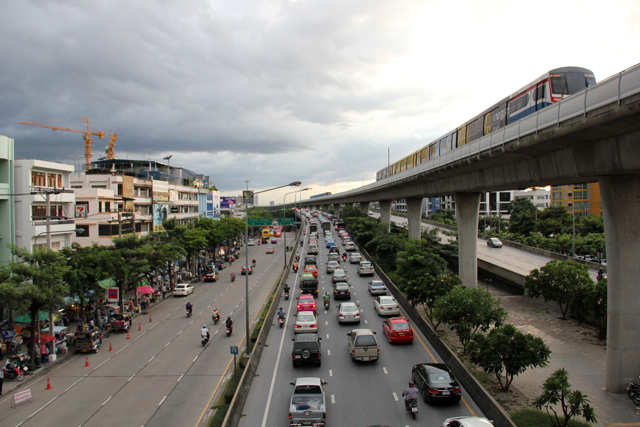 Relatively new to Bangkok’s transportation scene are the BTS, MRT, and Airport Link. The BTS and Airport Link are both mass transit trains that run on tracks elevated above ground while the single line MRT is an underground subway. While there are grand plans to create more train lines catering to the farthest regions of Bangkok, as of now the the mass transit system only covers the central areas of the city. Many cheap flights to Thailand have increased international visitors, so having the Airport Link is extremely beneficial for getting from the airport to the center of Bangkok. Bangkok is a city that’s literally saturated with taxis. There are so many that I sometimes wonder just how any of them can make a profit. Taxis, though they sometimes refuse to give you a ride if it’s somewhere where there’s too much traffic, have the potential to go just about anywhere in Bangkok. 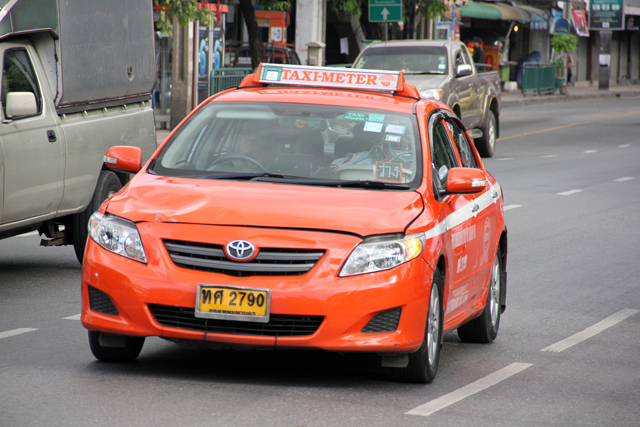 Taxis are quite affordable as well; A ride around central Bangkok shouldn’t cost more than $3 – $5. Though there are many cheap flights to Phuket, I've even heard of people just hopping in a Bangkok taxi and heading straight there! By far the cheapest way to travel around Bangkok is by taking the local public bus – on some routes there’s even a free bus if you don’t mind waiting! 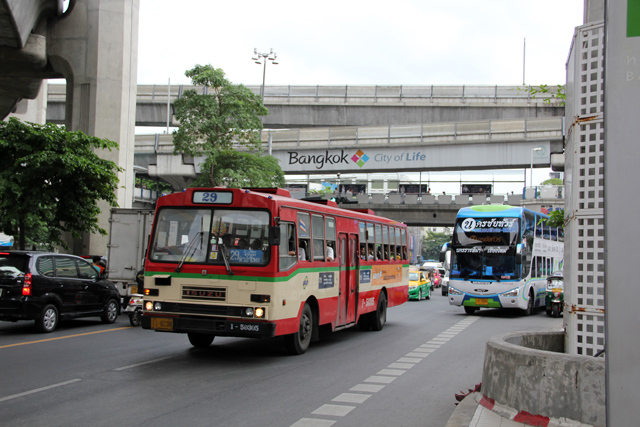 The Bangkok bus network is far reaching and overall it runs quite smoothly. There are all sort of different buses like some that take the highway, some with air condition and others with open air windows. One of the most famous forms of transportation in Bangkok is the tuk tuk, basically a three wheeled go cart with a metal body attached. Tuk tuk’s are extremely popular for visitors who enjoy the novelty of such a mobile. After taking my share of tuk tuk’s I’d have to actually say that they are not the most comfortable form of transportation. The seats are a little high making it difficult to see the roadside and being open air you smell all the vehicle fumes. That aside, it can be fun every now and then to whizz through Bangkok on a thundering tuk tuk. 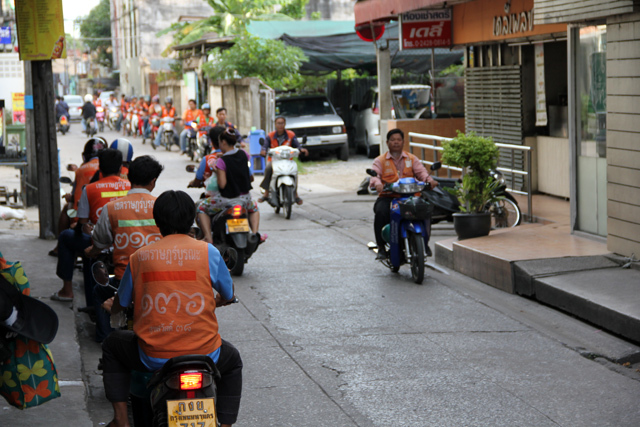 Possibly the most convenient and most thrilling way to travel through Bangkok is by motorbike taxi. Official motorbike taxi driver’s are everywhere in the city and they are always ready for you to hop on and deliver you straight to your destination as fast as possible. When the streets are clogged with traffic, motorbike taxis have the advantage of sliding between lanes, weaving through vehicles and even taking the sidewalk! Visiting Bangkok you'll most likely use most, if not all of these forms of transportation to get around. Sometimes getting from place to place can be a daunting task, but luckily Bangkok has so many different transportation options to choose from. Disclosure: This post was written by Mark, and brought to you by STA Travel. Good idea and good post! Taxi boats Bangkok is also another way to travel without traffic lights. Tuk Tuk and Moto I hated the most. Tuk Tuks were out to rip you off. Motos either helped to create traffic, or were trying to run me down on the sidewalk. Hi, Just wanna share some experience regarding transit via Bangkok. Its on 8th of Dec 2012 when I was to travel to India from Singapore via Bangkok so I got to Bangkok from Singapore by Air Trans and then I was supposed to fly to India from Bangkok by Indigo. Both are budgeted airlines and I did this ticket booking myself online few weeks earlier. I could not notice that Air Asia leaves me at DMK and I was to take flight for Delhi from BKK. both are in Bangkok and both are international airports. Most of you would never make a mistake like that but what if you are one of my kind :). I incidently was carrying only 23 Sing dollors in my pocket as didnt anticipate any need for cash, as I was carrying ample of ATM’s and credit cards. So once I landed at DMK, Bangkok, I immediatly tried to find out my gate for my next flight which was only 3 hours from then, and amazed myself to find out that not only its an another airport – BKK airport, also it is a little over one hour away from DMK which has my next flight. I got stuck there, I tried to seek help except begging for money. I talked to all possible people including pretty Air Hostess, out of which one finally helped me and called some Air Asia personal who was merely a Security person and could not do anything under the procedure which could bail me out of this situation so he offered to give me enough money for Visa so that as soon as I cross Immigration and get to ATM, I return it to him which felt as if some Angel is lifting from me a big deep dark deep trench and flying me over the beautiful green mountains. Soon I was out and got into an CAB. It was now 11:30 PM and my next flight was to start at 1 AM from BKK. On the way, I had almost imagined to book a massage for the next day as there was hardly any hope to catch my flight but for the most part I was positive that I am gonna make it. Thoughtfully, I had taken out some extra cask from ATM which helped me to put some speed into the CAB. I gave the Cab Driver extra 100 Baht’s every 10 minutes. He didnt understand English so I spoke FAST couple of times and hand over the currency which worked. It was now 12:15 AM when I got out of the Cab at BKK and Ran as fast as I could with my luggage. Thankfully I had no bags to check in and I actually slipped thru the closing door . People at the Airport were extremly courteous and helped me thru check-in , security and at the boarding. I didnt speak to anyone except asking for water for a long time and thanked God for helping with all of this and especially that old Security Gaurd from Air Asia who trusted and landed me the money at the right time. I hope it helps for anyone to make better transit plan if at all required to go thru the Bangkok, otherwise thanks for reading. Great tips mate, we are heading here next year for a long weekend so I found this post very useful! Thanks!